SAN GERONIMO, Baja California, Mexico is a .75-mile-long island that lies 8.75 miles SSE of Punta Baja, 5.25 miles WNW of San Antonio Point, and 2 miles N of the north edge of the infamous Sacramento Reef. 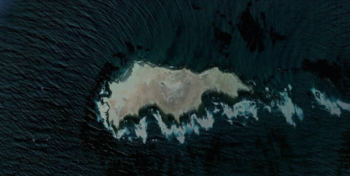 It is one of the smallest islands off the Pacific coast of the Baja Peninsula. 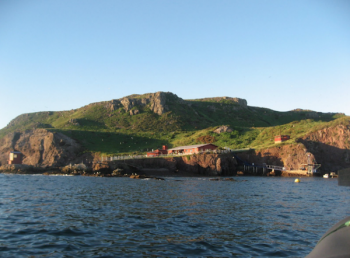 Isla San Geronimo has a lighthouse and only 10-12 recorded species of plants. The Island Bush Mallow, Malva pacifica, is one of the significant plants found on the island. The shores are filled with abundant colonies of ground nesting birds, and many pinnipeds. There is a fish camp on the eastern beach of the island. The Sacramento Reef lies nearby offshore, and is named for the wreck of the passenger steamship with great loss of lives. The reef is 2.5 miles wide, including a detached 18-foot spot, 2 miles long, and runs NW to SE. The northern edge of the reef is 2 miles south of the southern tip of Isla San Geronimo. Its southern edge is 3.2 miles WSW of Cabo San Antonio, and its western edge is about 4.5 miles west of San Antonio.